I just posted a big laptop-tablet hybrids roundup, one of which included the Galaxy TabPro S (top right corner). When we originally reviewed the TabPro, we gave kudos for its long-lasting battery. But when we actually pitted it against the competition, the difference was staggering. 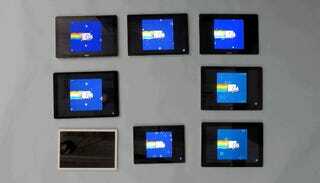 We set all 8 tablets to the same brightness (200 nits) and turned on a 10-hour-long video of Nyan Cat. We also muted the volume for the sanity of our co-workers. Although not the most advanced battery application, it does accurately show how well each tablet can handle streaming stuff from the internet, something we tend to do a lot. Although the most press Samsung’s gotten recently in regard to its batteries was its controversial decision to make them non-removable in its most popular smartphones, Samsung is really good when it comes to battery life. Aside from the TabPro S, the Galaxy S7 Edge also did extraordinarily well when testing its battery life. Of course, another big reason is Samsung’s screen technology. While most of the panels in other 2-in-1s run an IPS LCD display, Samsung’s AMOLED tech means it can sip on battery while others have a more gluttonous diet.